A kidney transplant operation is when a kidney from one person is placed in the body of another person. A kidney can either be donated by someone who has died (a deceased donor) or from a living person. If you are diabetic, you might be suitable for a combined kidney and pancreas transplant. This article is based on content provided © courtesy of Guy’s and St Thomas’ NHS Foundation Trust. How do I know if I can have a transplant? You will need to discuss the options open to you with your kidney team as early as possible so you can make the best decision for you and your family. If you feel you need more information at any time, please ask. You will also go through a series of tests to make sure that you are fit and healthy enough to have a transplant. For many patients with chronic kidney disease (CKD) a transplant is the best treatment choice, giving you the best chance of having a lifestyle similar to the time before you became ill.
A transplant is also the treatment option that is most likely to improve your long-term health. If you have other conditions as well as CKD, for example significant heart or lung disease, you may not be fit enough for a transplant operation because the risks would be much greater than the potential gains. If you are obese, the risks of having a transplant operation may be too great and technically difficult. The hospital can give you support to lose weight. If you have a kidney transplant, you will need to take anti-rejection medication to stop your body’s immune system from recognising the kidney as foreign and destroying it. Your body recognises the kidney as foreign partly because of characteristics called the tissue type. If your tissue type is similar to the person donating the kidney then your body is less likely to reject the kidney. The cross match is the final blood test before a transplant operation happens. It checks if you have any antibodies to the donor kidney, which could damage or destroy it. The operation can only go ahead if the result of the cross match is negative. Paired or pooled donations – When a donor and recipient are incompatible or mismatched with each other, either by blood group or by tissue type, it may be possible for them to be matched with another donor and recipient pair in the same situation and for the kidneys to be exchanged or swapped. This is called paired kidney donation. Each recipient benefits from a transplant that he or she would otherwise not have had. When more than two pairs are involved in the swap, it is known as pooled kidney donation. Altruistic donation – This is used only in kidney transplantation. It is where a person volunteers to donate a kidney to an unknown recipient, someone they have never met before. The benefit of this type of donation is that a person in the national transplant pool receives a living donor kidney transplant and the number of patients waiting is reduced overall. This increases the chance of other potential recipients receiving a kidney. There are several advantages to having a living donor transplant, including the chance to plan the transplant before the need for dialysis (a pre-emptive transplant). A living donor kidney transplant before you start dialysis offers you, the recipient, the best chance of long-term transplant survival and freedom from dialysis. Although all operations carry some risk, once the donor has recovered from the surgery, he/she can usually live a normal and healthy life with no impact on their long-term health. You can find out more about living kidney donation from the Making the gift of life DVD. Ask the kidney team for a copy. Deceased donor transplant – This is when you receive a kidney from someone who has died. There is a national pool of people waiting for this type of transplant. but it can also be transplanted on the left side. The exact positioning varies according to the individual patient. 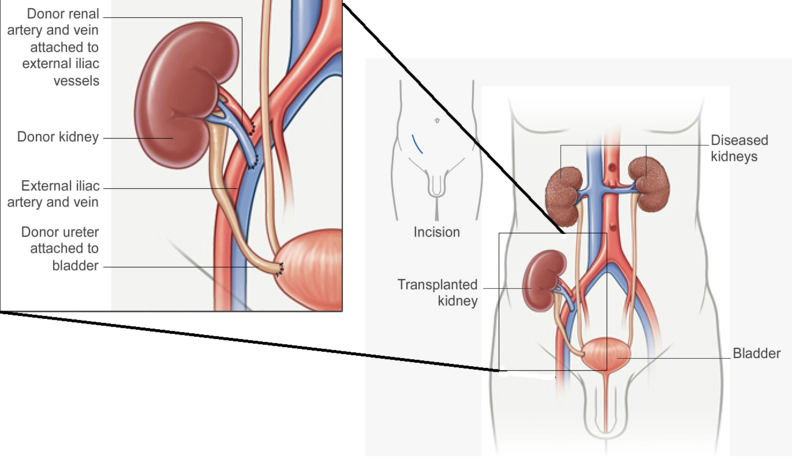 The blood vessels of the donor kidney are attached to your blood supply, and the ureter (the tube which connects the kidney and the bladder) is joined to your bladder. The operation will leave you with a small scar which will fade over time. A small tube called a stent is put down the ureter to ensure you can pass urine and to protect the join with your bladder. Once you have healed, you will need a small procedure about three months after your transplant to take the stent out. Your kidneys are not usually removed. You might find you have more energy, making you feel more able to cope with everyday life, including work or studies. If you have Type 1 diabetes and have a kidney and pancreas transplant, you should no longer need to take insulin or tablets to control your blood sugar. You will not need to travel to hospital for dialysis. However, you will need to come to hospital every week for clinic appointments for up to six months after your transplant. After this time you will come into clinic less often. There are the general risks associated with having surgery and a general anaesthetic, including the risk of infection. These will be discussed in more detail as part of the consent process. There is always a risk your body will reject the new kidney. This means the body’s immune system recognises a transplanted kidney as foreign and tries to attack it. Therefore you will need to take anti-rejection medication for the rest of the time the kidney is working. You may have side effects with this medication, such as excess weight gain, hair growth and an increased risk of some cancers, including skin cancer. Many of these can be prevented by carefully following the advice of the healthcare team. It is especially important that you do not stop taking any medication without first talking to your kidney doctor or nurse. How do I know if I’m in the transplant pool? If you are unsure, please ask the nurse or doctor when you come to clinic. Anyone wanting to donate a kidney will need to have a thorough assessment to make sure that they are fit and healthy enough to do so. Blood tests will show whether your donor is compatible. If the donor is not compatible with you this means that you, the recipient, have antibodies in your blood against your potential donor’s blood group or tissue type. We might be able to remove the antibodies from your blood by a process similar to haemodialysis which involves ‘washing’ the blood plasma to make it safe to go ahead with the transplant. Or you might want to consider paired or pooled donation. Sometimes a kidney transplant fails. Most people can have further transplants if this happens. If your transplant fails, you might need to have an operation to remove the failed kidney. The success rate for subsequent transplants is generally as good as for the first. However, you are likely to wait longer. You will also need to go through the same tests again to make sure you are fit and healthy enough to have another kidney. Why do we need more Black, Asian or Minority Ethnic (BAME) donors? 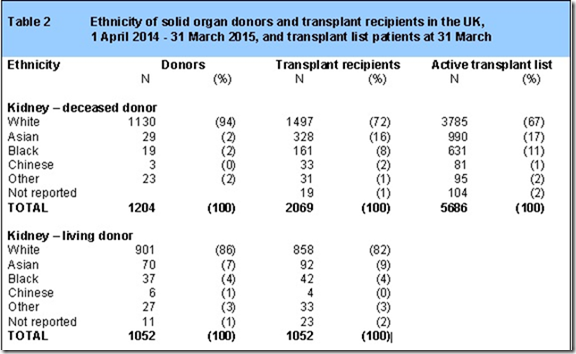 BAME groups represent 31% of the active transplant list but only 6% of the deceased donors and 16% of the live donors. Transplantations are more successful when the donor and recipient are from the same ethnic background (due to blood group and tissue type compatibility). As a result, BAME group patients wait on average 1 year longer than their white counterparts. For more information about this, including videos from black and Asian communities see here. Ask the kidney team for a copy of the booklet A patient’s guide to kidney transplantation. You may also wish to ask for a copy of the DVD Making the Gift of Life. These and other booklets and information is available from St George's transplant coordinator. A BBC film about organ donation and featuring St George's Hospital is below. Talk to your family and friends about living donation. Watch the DVD Making the gift of life to find out more about living donation. Talk to a peer supporter about what it is like to receive a transplanted kidney. Talk to us about your holiday plans as early as possible and keep your contact details up to date if you are in the transplant pool. Stay healthy – take your medication, eat a healthy diet and exercise regularly. Use sunscreen and do not stay out in the sun for too long. Am I in the transplant pool? 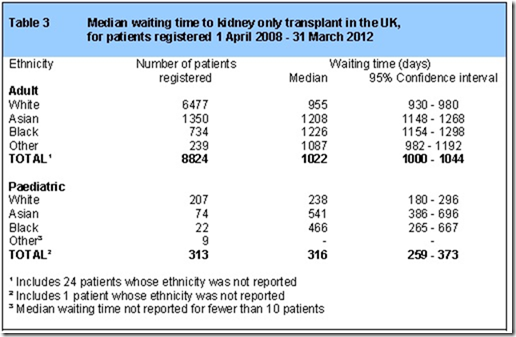 When will you consider doing a pre-emptive transplant?